General education department has published the educational calendar for Primary, Secondary, Higher secondary and Vocational Higher secondary schools under General education department. The activities of each year are orchestrated as per the academic calendar published by the education department. Right from the beginning of the academic year to the end (June - May), all activities can be carried out with the help of the calendar. As per the calendar, Higher secondary will have 200 working days and vocational higher secondary will have 222 working days. To complete 200 working days as given in the calendar, 7 Saturdays will be working days for Higher Secondary too - August 18, September 1 & 22, October 6 & 20, November 24, January 5. According to the educational calendar, first year improvement exam will begin on 4th of July 2018 and end on 11th July. First Term examination will begin from 10th August 2018. Second term examination will begin from 13th December 2018. Model exam for higher secondary second year students expected on 4th February 2018. Practical examination for plus two students is on Feb 13th 2019 and it will be completed by February 28th. The higher secondary public examination for the academic year 2018-19 is on 6th march 2019 and and it will be completed by March 27. Dates in the calendar are tentative. Higher Secondary public exam valuation starts on 1st April 2019. Results will be declared on May 10th. School youth festival for the academic year 2018-19 starts from September. Apart from public holidays, the closing and reopening dates after Onam, Xmas and summer vacation are given in the educational calendar. This time, the prime paintings and drawings of State Youth Fest in collage form beautify each page of educational calendar 2018-19 published by General Education Department. 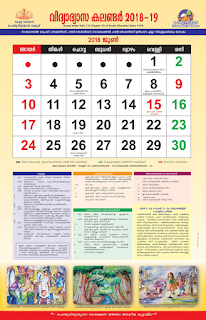 The educational calendar for 2018-19 published by General Education Department can be downloaded from the link.